and extraordinary voice. She is a critically acclaimed Jazz and Cabaret performer and an award-winning Musical Director. This summer you’ll find Libby performing beachside at no other than idyllic Norfolk Island. Adding Norfolk Island to her long list Libby has entertained audiences worldwide with her unique talents, performing in New York, Tokyo and Toronto and Australia-wide. 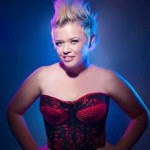 Highly regarded as a solo artist, Libby has performed seasons for the Adelaide Festival of Arts, Edinburgh Fringe, Sydney Spring Festival, Perth International Arts Festival, the International Jazz Educators Convention, Adelaide Cabaret Festival (including working with Broadway composers Jason Robert-Brown and Andrew Lippa), Melbourne Fringe, Adelaide Fringe, Feast Festival, and the Wangaratta Jazz Festival. December will be Libby’s second visit to Norfolk Island, recently accompanying Beccy Cole last May you could say Norfolk Island has got under Libby’s skin. Only two hours flight from Australia, Norfolk Island is like travelling to another world, with a relaxed island vibe the people are friendly and the island is remarkably stunning. Don’s Double Dose, Norfolk Island’s own Rick Robertson, and Down South Jazz Quartet. Contact The Travel Centre Norfolk Island for more information regarding her specially escorted tour 7 night packages start from $1919 per person twin share ex Brisbane and $1959 per person twin share ex Sydney. Prices include return airfare (seat + bag) to Norfolk Island, airline taxes, meet & greet at the airport, 7 night’s twin share hotel style accommodation, return airport transfers on Norfolk Island, 7 days car hire (hire car surcharge $20 per day plus petrol extra), Devonshire tea on arrival, Daily continental breakfasts, Welcome dinner with Libby O’Donovan, Half day island orientation tour with Libby O’Donovan, Farewell dinner with Libby O’Donovan, Jazz festival pack including entry to 5 concerts (2 including dinner and 2 including lunch), souvenir program, Norfolk Island Jazzes it Up polo shirt, cap and gift bag, Free wireless internet in Paradise Hotel lobby, Islander fruit cocktail on arrival, Sunset cocktails & canapés on Monday at Paradise Hotel, All day tea & coffee station at Paradise Hotel, Free daily shuttle to & from Burntpine shopping precinct, discount shopping card, complimentary mini-golf and complimentary ‘A Walk in the Wild’. Competitive add-on fares from Melbourne, Adelaide and Perth available.